Kashmir holds not only a distinction of being a picturesque tourist place, but also a melting pot of various religious centers and pilgrimage spots – which makes it a busy religious tourism destination all across the year. In fact, religions have inspired the construction of some of the most spectacular monuments in Valley and all forms of art and architecture find expression in them. It is because of the religious character that the three regions of Jammu and Kashmir have got a unique identification: While Kashmir Valley is known as a land of Sufis, Jammu city is called a land of temples and Ladakh is famous for the gumpas and monasteries. So in all three parts of the state, pilgrim tourism remains the most happening activity besides the normal tourist flows. Attempts are afoot on part of the government to give proper boost to the religious tourism and make Jammu and Kashmir a hub for spiritual and religious travelers. Special infrastructure is being created to materialize the plan. The tourism ministry is also contemplating to create spiritual circuits in Jammu, Kashmir and Ladakh regions. J&K Tourism has plans for promotion of religious tourism and three mega projects have been conceived for implementation and Detailed Project Report’s (DPR’s) stand submitted to the Government of India. The project worth Rs 150 crores is aimed to develop tourism circuits in three regions. While Rs 50 crore of the stipulated cost is to be utilized to promote Buddhist-related tourism in Ladakh, Rs 100 crore is to be used to boost Sufi tourism in Kashmir and to restore various pilgrimage centers in Jammu. The famous religious tourism spots of Kashmir include Hazratbal, Kherbawani, and Amarnath Cave. But it is the Amarnath Cave that receives largest number of pilgrims. So we can say that in terms of numerical numbers, Amarnath is largest religious tourism destination. Amarnath Yatra is not only special for Hindus but for Muslims too. Hundreds of Muslims could be seen offering their services for the smooth conduct of the yatra. So the pilgrimage provides a secular tinge in an exclusively religious environment. It provides a chance of interaction and intermingling of intra and inter-religious communities and promotes feelings of communal harmony. Amarnath cave is a Hindu shrine dedicated to Hindu God, Shiva and is located in South Kashmir Himalayas, at an altitude of 3,888 m (12,756 ft), about 141 km from Srinagar, and reached via Pahalgam and Baltal routes. The shrine is considered to be one of the holiest shrines in Hinduism. The cave is surrounded by snowy mountains. The cave itself is covered with snow most of the year except in three summer months (from mid June to mid August) when it is open for pilgrims. Thousands of Hindu devotees make an annual pilgrimage to the Amarnath cave on challenging mountainous terrain to see an ice stalagmite formed inside the cave. It is believed that after the middle Ages, this cave was forgotten by people before it was discovered by a shepherd, Butta Malik, in the 15th century once again. Story goes that a saint gave Buta Malik a bag full of coal. On reaching home, to his utter surprise he finds the bag was full of gold coins. Overwhelmed with joy, he wanted to thank the saint. But, he found that the saint had disappeared. Instead he found the Holy Cave and Shiv Lingam there in. He announced the discovery of this to the Villagers. Then onwards this has become the sacred place of Pilgrimage. Another story relates to Bhrigu Muni. Long time ago, it is believed that the Vale of Kashmir was submerged under water and Kashyapa Muni drained it through a series of rivers and rivulets. 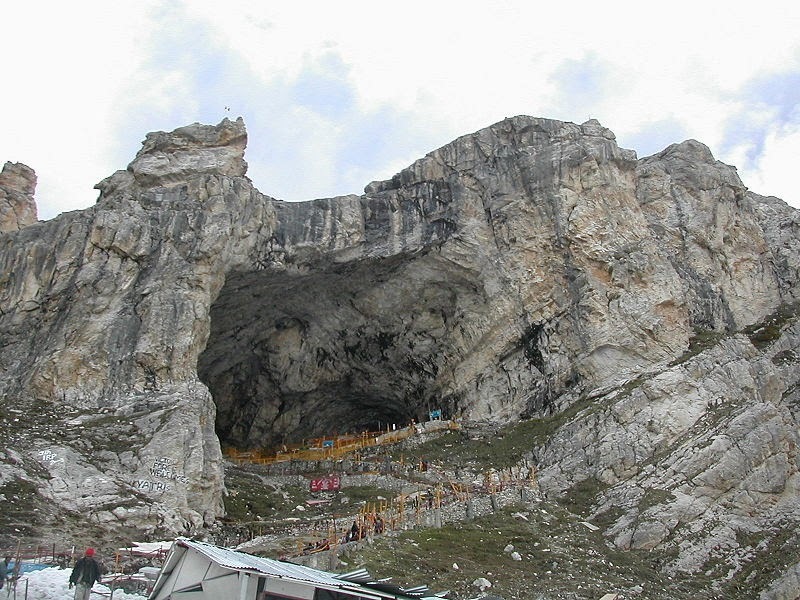 Therefore when the waters drained, Bhrigu Muni was the first to have Darshan of Lord Amarnath. Thereafter, when people heard of the Lingam, it became an abode of Lord Bholenath for all believers and a pilgrimage which is performed by lakhs of people every year. The government is very particular about the arrangements and facilities for the proper performance of worship by the Amarnath pilgrims. Security remains the major concern so special care is being taken to ensure an incident free pilgrimage. Large part of the state machinery is pressed in to service during the Yatra period to ensure that enough arrangements of civic and medical facilities are put in place, for the religious journey. The annual pilgrimage is managed by Amarnathji Shrine Board (SASB) through Jammu and Kashmir Amarnathji Shrine Act 2000. The board is headed by Jammu and Kashmir Governor, who is ex-officio chairman of the board. On the directives of SASB and state government, each pilgrim is supposed to carry a valid health certificate issued by a recognized doctor and have to go for prior registration before embarking on Yatra. However, the government finds itself strained in managing and facilitating the huge number of the pilgrims. Good faith ensures spiritual power of the believers and instills a sense of responsibility for the community and environment in them. Here pilgrims hold responsibility of protecting environment and follow directives from administration in this regard. Rules and regulations should be strictly adhered to, because nature’s rule is such that it takes two to make a tango. If we preserve the environment, the environment too will save us and our faith. Environment issue is not restricted to Kashmir only. It has assumed an international challenge and the alarming situation demands a need for a global awakening. But given the fragile nature of Kashmir’s environment, particularly the areas surrounding the Amarnath Cave and the routes that lead to it, authorities are duty bound to ensure that mass flow of pilgrims to an ecologically fragile area doesn’t cause harm to it. But the ground situation presents a different picture. Such remains the scale of the yatra, that at its peak, the two base camps at Baltal and Pahalgam, huge camps with thousands of tents pitched across miles of once green meadows. The enormous numbers directly reflect on the facilities provided to the yatries. There's a lack of toilets and a lot of pilgrims end up relieving themselves into the open by the rivers passing by the base camps. Furthermore a lack of a proper waste disposal system in both the camps and along the routes to the cave means that the whole area is littered with plastic bottles, wrappers and other non-biodegradable pollutants, even much longer after the yatra is over. The main victims of colossal waste produced by increasing number of pilgrims are the fragile ecologies of Baltal and Pahalgam. These two ecologically sensitive places take much of the pollution onslaught year after year, without repair or rescue. The famous Lidder River too is a victim of the yatra pollution. This onslaught was documented in a 37-page report released by the Jammu and Kashmir State Pollution Control Board (JKSPCB) in 2006. The report expressed concern over not regulating the yatra in a manner that protects the environment. It specifically pointed out that the situation in Pahalgam, the main base camp of the yatra, was alarming and called for immediate measures to protect the sensitive ecology of the Pahalgam valley. *Obaidur Rehman is Addl. Director General, PIB Srinagar and *Shabir A Dar is Information Assistant, PIB Srinagar. Views expressed by them in this article are their own and do not necessarily reflect the views of http://news.BDTV.in.